The Orlando Apollos rebounded in a big way, dominating the action against a lesser-manned Atlanta Legends team on Saturday afternoon, 36-6. The Apollos became the first AAF team to secure a playoff berth in the inaugural season as they improved to 6-1, thwarting any ideas of weakness after last week’s loss to Arizona. 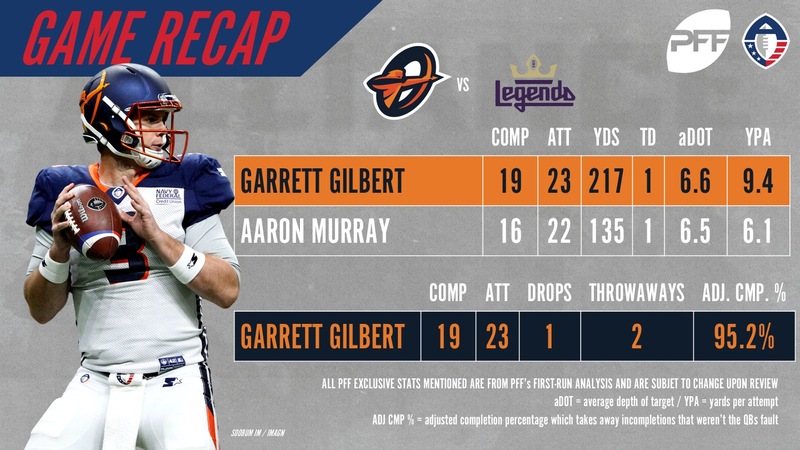 PFF’s ReFocused series this season features immediate takeaways and a key to the victory from PFF’s lead AAF analysts and grabbing quick first-run statistics from our team of analysts who watched every player on every play of the game. For more data and analysis from the game, utilize our Premium Stats 2.0 dashboard to expand your knowledge on the key players, signature stats and much more. Apollos QB Garrett Gilbert got back on track in a big way himself, completing 19-of-23 passes for 217 yards and a touchdown as two of his incomplete passes were throwaways and another was dropping, giving him a ridiculous adjusted completion percentage of 95.2% on the night. Gilbert tossed the ball around at will, and relatively equally, hitting Charles Johnson for a score on five targets while he targeted Jalin Marshall a team-high six times. As impressive a passing performance as you’ll find, Gilbert continually kept his team in the flow of the game with short passes and took what the defense gave him. However, it was De’Veon Smith and his three rushing touchdowns that stole the stat sheet for Orlando. Smith tallied 13 carries for just 40 yards but three scores, and considering he had a long carry of 25 yards, his usage clearly was that of the ground-and-pound back for the Apollos. D’Ernest Johnson was impressive in his own regard, rushing just seven times but achieving a game-high 54 yards on the ground. Orlando’s defense was just as dominant as well, intercepting Legends QB Aaron Murray twice including one by Deli Olatoye that was returned 65 yards for a pick-6. Reggie Northrup flew around the field and led the team with five defensive stops as the Apollos seem more than ready in all facets to be the odds-on favorite to win the first-ever AAF title in April. For more access to AAF data – sign up for PFF Elite to check out grades and stats from every player on every play of every game from the 2019 season!